Passive Equalizer is a three-band EQ with an unprecedented clear and open sound, a warm low end and sparkling top. Active Equalizer is Passive's counterpart with three fully parametric bands and a tight and focused sound. Focusing Equalizer is an untraditional take on the EQ concept where the low, mid and high bands move automatically and musically in relation to the high and low cut filters. 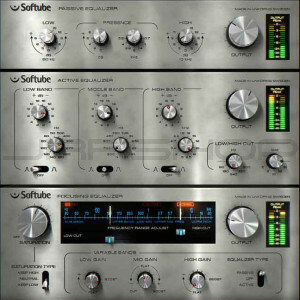 It also features filters from the Passive and Active EQ's as well as an outstanding one-knob Saturation control. At first glance it may seem like you're sacrificing versatility by using an equalizer with a limited set of options - why use a three-band equalizer when you can use your digital equalizer with umpteen bands, continous gain, selectable Q and different curves all built in? Well, equalization is all about sound design. Having an equalizer where the designer has already made some of the choices four you is like having an experienced sound engineer helping out and giving you directions. All equalizers are modeled using the same state-of-the-art technology as we used to create our very popular FET Compressor and the Brilliance Pack plug-ins for Abbey Road. 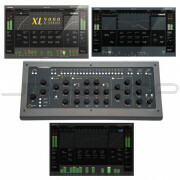 Excellent treble control without any "digital harshness"